Onward to adventure! Still working on my daytime lighting, I’m a little more pleased with it this time. Topwebcomics has been one of the most successful ways of bringing in new readers! If you take the time to vote often, it really helps out a lot. Enjoy the incentive! I don’t know about this one. It just feels like there’s a page missing between this one and the last. Anybody getting that too? I figured it out the colors fine but the sky is takeing up too much space makeing the color appeare uniform even with the clouds breaking up the sky. In other words pannals 2 and 3 are good but the sky in 1 and 4 look too as I said aqua. The contrast between the landscape and the sky is good. I have compared yours to twokinds recent few comics and the sky is broken up between different color backgrounds from pannal to pannal so it doesn’t appeare too blue or another color. I know that’s not a fair comparison but it’s good to look and learn from other comics. And keep your style the same throughout background foreground and characters. Otherwise good work you’ve came a long way. Thanks for the feedback, I think a deeper blue will fix the problem. The sky can be pretty blue, but this isn’t quite the right hue. Good to hear you’re enjoying the art otherwise! It’s panel. PANEL. Get your spelling straight, goddammit! Sorry about my terrible spelling but I think my point got across all the same. I know it bothers some people but we all can’t be english majors and for that I am truly sorry. 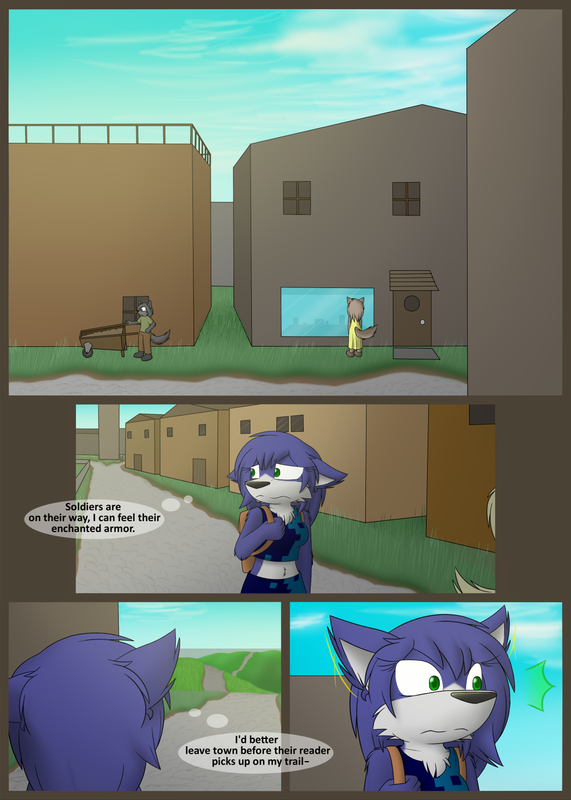 Furminium: Yeah I wish I had more time to put into the buildings on this page, they ended up looking a little plain. Your right… Maybe it just the contrast in color that’s giving off that vibe. I don’t know but we will see if your other characters look that way too. I can hear the Metal Gear ” ! ” in the last panel.